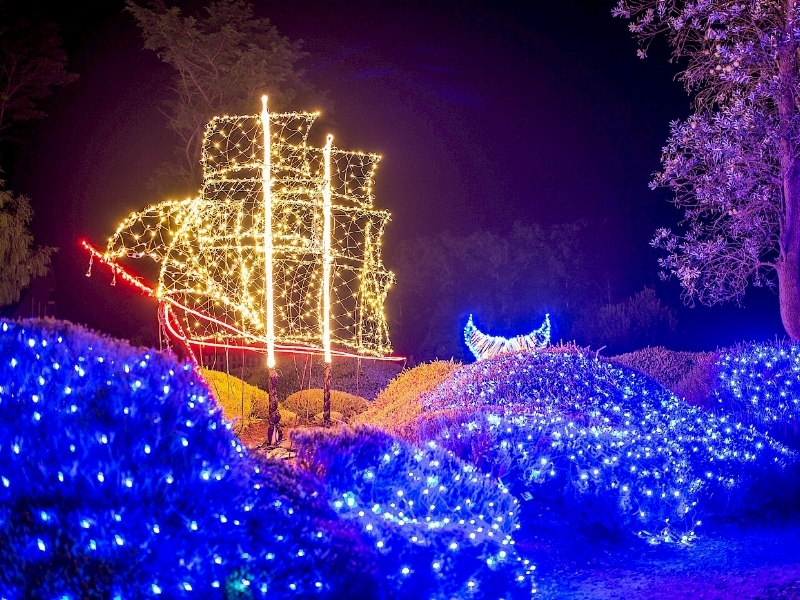 A favorite local holiday tradition was born 8 years ago when the Mendocino Coast Botanical Gardens unveiled their very first Festival of Lights extravaganza. Developed, created, and run almost exclusively by a dedicated and passionate group of volunteers, this event attracts thousands of visitors during its 3-week span. In fact, last year more than 9,000 visitors meandered the glitteringly transfigured paths of the Gardens, making it one of the best-attended events in Mendocino! A fundraiser for the Botanical Gardens, the Festival of Lights is a true community event, with large involvement from pretty much everyone around. Local musicians give of their time and tuneful talents to perform live in the hospitality tent. (Two of Brewery Gulch’s very own will be playing there with the Latin band Pura Vida on December 1st!) The local breweries and wineries donate delicious beverages for the bar, volunteers bake an endless array of goodies for the café, and everyone who is able comes to enjoy the inventive light displays and embrace the cheerful joy of the season. Adding to the general air of festivity, there is usually a fire pit behind the fuchsia gardens for roasting marshmallows. The hospitality tent in the front of the Gardens is beautifully decked out, the perfect spot to warm up chilly fingers while enjoying the live music and the excellent local beers and wine. The Garden’s café gets into the spirit of things too with hot chocolate and cider. We here at the inn love going every winter to see what inventive new light displays have been added from the previous year’s Festival and which designs have been brought back and even improved. The undersea theme in the succulent garden is probably one of our favorite sections. The inn’s owner, Guy, and his wife Sarah are going to be taking their little girl Ella for the first time this year, and they’re pretty excited to get to share it with her in all its glittering glory. We went to the Festival of Lights for the first time last year, and it was a magical experience! The little ones had so much fun, running through the lighted pathways and gathering around the bonfire for s'mores. The adults especially enjoyed the live music from talented local favorite artists and the tasty treats and drinks. The holiday spirit and relaxed atmosphere made for a cozy and cheery time for all! This year, the Festival of Lights starts today! It runs through December 16th, open every Friday, Saturday, Sunday from 5:00 – 7:30. So, go! What are you waiting for?! Jump on in and join this holiday favorite with locals and out-of-towners alike – go see the Festival of Lights!